Hello Friends! How are you today? My hope is that you are feeling the joys of the season and not the stress. The news this morning reported that 80% of people are stressed (that took the survey) but, I know holidays is hard for so many people. If you are feeling stressed maybe carve out a little you time and color! That is exactly what I did last night and I loved every minute of it. Honey Bee Stamps has been celebrating the 12 days of Christmas for the past 11 days and I was thrilled that they asked me to participate. Thank you Melissa and Lisa!! Love these ladies! More about the 12 days at the bottom of my post. A chance to ink up these delightful stamps puts a big smile on my face! The sets I used were these wintery flowers (swoon) called, “Winter Anemone” and the so expressive lil’ snow people called, “Snow Buddies“. So fun to color!! Yes please! When I am painting one layered cards I always like to add something dimensional like twine. Mine is natural in color so that I can color it with a marker to match my colored image. Adding details and colored areas to the nooks and crannies with colored pencils, 0.03 fine tip marker and a sharpie really make the images stand out. Yes, a white gel pen too…. always! Check out my video here. Before I move forward with adding details and filling in the nooks & crannies … this is how my card panel looks. What do you think? Is it calling for more to you? It is screaming to me lol. This is where and how I purchased my watercolors. Honey Bee has a FUN 12 days planned for you. 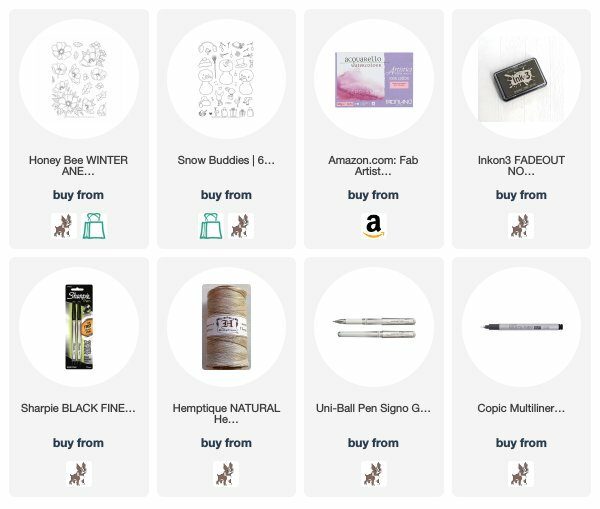 During their 3rd Annual Twelve Days of Christmas event, you will receive daily discounts on the products I am using plus they will do a drawing from the comments on their blog for a winner of one stamp set that I used today! Pretty cool! On another note now is time to purchase the 0.03 and the copic blending solution I use all the time because they are currently 25% off just in time for the holidays. Yay! USE THE CODE COPICSALE! Card Supplies and Links: Affiliate links are used at no cost to you and 100% goes to support my Coloring Challenge Road Trips . Waffle Flower Video and hop! Love your amazing colouring! Adorable card!!! Awesome coloring Kathy-you inspire me! You do such beautiful work Kathy. I would not have thought to use those flowers around the snowman like that. Reminds me to think out of the box. Oh Kathy this is fab. Love the colours, really fun & festive. LOVE the SWEET snowman surrounded by the VIBRANT anemones – WOW – such a WONDERFUL design that POPS – LOVE IT ALL and he is PERFECT just the way he is! How cute is that! Never in a million years would I have thought to create a scene with a snowman and flowers, but I love it. Your painting/coloring and the colors you chose are wonderful. Love your scene Kathy, these Winter Anemones are so beautiful and the snowman is way too cute. I think the work in the nooks and crannies does make a huge difference in the depth you’ve by doing just that little bit extra. Great adorable card and even greater video Kathy. I love this tutorial about nooks and crannies. The card get such depth and dimension from filling the nooks and crannies. You only have to look at the bright green leaf on the bottom left ( the one who touches the snowman) to know how important it is for your image. Thatleaf looks like a real leaf that lies on top of the card., so awesome. Thank you so much for sharing Kathy. Your pencil points are great. Can you tell me what pencil sharpener you use? This is a lovely holiday palette and these images are just the sweetest. Thanks for sharing your tips and the technique video. Kathy, you are such an amazing colorist. I could watch you color all day. This card is so beautiful and fun. I love the absence of a sentiment on the front.